Much has been made of social graphs as filters for discovering new content, to the extent that many are now challenging the view that a social filter is even remotely indicative of interest – "…who you know doesn't always translate into what you like"
I'm not convinced that there's such a thing as an "interest graph" – as suggested in the recent Social Graphs Vs. Interest Graphs – but I do believe there are useful intent or interest models, that can be extrapolated from an individual's behaviour. Flipboard, ShowYou and others aggregate media based on your friends' articulated sharing; this can result in many false positives, with inferences drawn from a semi-autistic social model; our articualted social graphs are driven by liquid affinities and etiquettes. What's perhaps more insightful is the notion of aggregating media, based on what you own and use… collected artefacts thoroughly riddled with your tastes, memories, aesthetic choices and emotions. The recently launched Bandito for iOS is an useful illustration of this – Bandito examines the content of your iTunes collection and suggests news items based on your tastes. Curiously, Bandito is a collaboration between a music licensing marketplace and music data provider - suggesting some novel, emerging value chains for the music industry. Conversley, the wonderfully serendepitous and sublime Shuffler.fm aggregates music from curated news sources into musical genres which also present the news item in its original context along with each track. "Playing" music blogs as continuous mixes implies a kind of social graph, but that's a contrivance – it's simply a collection of editorial and an act of curation. Curation is a little more deliberate than shotgun sharing. Whether acquired though piracy, digital stores or signals rippling through your social graph, what you collect - not who you know - defines your media genome. Your social graph – as it stands today – is autistic, lacking the subtlety, nuance and fidelty to articulate what you like; indeed, it simply broadcasts what others like. This possibility is now before us – for an application fee of £114000 (gulp!). However, I think there's a strong possibility of creating a sustainable component in many future value chains here – for local, international and national brands and organisations – as well as ongoing revenue for the authority that operates .leeds. With LCC as governing registry, other registrars can be authorised to sell .leeds domains globally, with a portion of those revenues flowing back to LCC on an annual basis. With LCC's position as a broadly-based and non-partisan representative of healthcare, communities, academia, business and government – a local council is a perfect host for governing a metropolitan domain that would be valuable to all parts of society that wish to be digitally addressable. I imagine this wouldn't be a huge priority for LCC – given cutbacks and other more pressing civic priorities, but for a small investment, the city could accrue a valuable piece of digital real-estate and enable long term, broad-based revenue. October 1999: I signed up for a Hotmail account in order to use MSN Messenger. July 2003: In eight years, I've listened to 81874 songs at Last.fm. September 2003: I've transacted 128 times on eBay since joining. July 2004: In seven years, I've accumulated bookmarked 3452 links at Delicious. February 2004: I joined Flickr after a demo from Stuart Butterfield in the corridors of ETech04. July 2007: Dopplr tells me I've spent 377 days and 250'000 miles travelling between 51 cities since July 1994. January 2010: Since joining as the 33574th user of Foursquare I've checked into various places a total of 616 times. Are life services better conceived of as those who's longevity you can depend on, decade-after-decade? As enterprises place source code into escrow, should citizens demand that personal data be similarly protected throughout the lifetime of individuals, not organisations? Should we be masters of our own domain? What would a language of design patterns for longevity look like? Could we finally accept DRM as an anti-pattern? If we are to submit to the Cloud, we need to ensure our electronic engrams have an afterlife. Last Saturday morning, I awoke to the heartbreaking news that my aunty Shamim, had passed away suddenly in Karachi. Amongst our extended family, my parents – two of the eldest – are seen as role models to their siblings and cousins. But Aunty Shamim was where my mother, her first cousin, looked for her own inspiration; and she was certainly an inspirational woman. Though she was only briefly married and had no children of her own, as a school teacher for more than four decades, she was a mother to thousands. Impacting and influencing many generations of Karachi schoolchildren as well as instilling in her own nieces and nephews, a love for the pursuit of knowledge. More remarkably – Aunty Shamim was the first of our family to gain a university education; the second was my Mum, also a schoolteacher. To be a woman, university educated, in Pakistan, in the 1950s made Aunty Shamim truly a pioneer, but her humility meant she never saw this as remarkable or unique. She experienced some significant heartaches and disappointment throughout her life, but her poise, elegance, wisdom and warmth starved any resentment. In another life, I imagined her as a UNICEF ambassador or Pakistan's Minister for Education. It is fitting that she left us as she always wished she would – on her feet, independent and without becoming a burden. You were never a burden Phupho Shamim, you were our privilege. 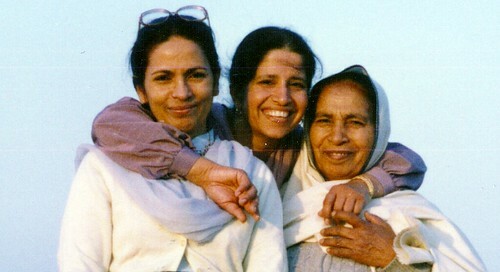 The photo above was taken at Karachi's Clifton beach in January 1988 – from the left: aunty, my mum and her mother, my nani. Here's another of Mum and Aunty at the same spot, as teenagers. What could you do with an archive of every text and photo message you'd sent or received between April 2008 and December 2010? This is the question I've been asking myself since O2 closed its Bluebook service, allowing users to export their data for posterity. The data is a prosaic 2.6MB package of XML documents, but buried amongst this archive are the stories of people, places, friendships, events and travels that represent almost three years of my life. Could cross referencing this with my Dopplr, Google, Flickr, Twitter, Gmail, Foursquare, Delicious, Last.fm, my blog, my bank and utilities records, give form to something unseen – or simply make the mundane tangible? Is this a Feltron-style art project, or the basis of an interesting product? I'm starting to feel that this kind of "meaning mining" is something that's moving from the canvasses of data artists like NYTE, Jer Thorp, Nicholas Felton and Stamen, to something that everyday users will demand. I joined the advisory board of Treasuremytext for this reason, it's why memory and recall are personally very important to me and why I believe the Quantified Self culture will yield an emerging field of 'revelatory life services'. "It's not the effect of technology on society, on economics, on religion, on war, on culture – etcetera – on art, it's that everything now is existing in technology as the new host of life. It's the price we pay for the pursuit of our technological happiness…"
The recent broadcast of Adam Curtis' All Watched over By Machines Of Loving Grace sought to explore how our post-digital culture has "distorted and simplified our view of the world around us". Curtis' hypothesis was sound and – more than a decade after the modern web's birth – a timely and healthy reflection on the implications of a planetary computing organism. Last September, at a meeting of the National Media Museum's Internet Gallery advisory board, Drew Hemment asked me to develop the 2011 conference programme for FutureEverything. I played hard to get, but in honesty, I was flattered that Drew appreciated my work. Just last week we finalised this year's programme, a programme that without Greg Povey's immense intellect and Kevin Moore's tireless tenacity, just could not have come together. He keeps sending us into the past. All we know are the rules; we can’t go further back then the day we’re born, or forwards, past the day we’re destined to die. He found that the very fabric of space-time itself appeared to store information about every event that had ever occurred in the past. We use this knowledge to find the prophets – the ones whose ideas upon which the world turns. He sends others back to shadow them and understand the impact of their works right up to the end of their lives. My job is to travel further back, intervene early and influence them to share what they know at the point they can have the greatest impact. He tells me to gather together the strongest, but only during the temporal shifts of Springtime and only near the place he calls Mamucium. We can’t tell them why. Once an individual space-time pathway has been used, we can’t use it again. So, that springtime synod of prophecy has to change their present, steering it away from the terrible future from which we come, saving humanity from fates unimagined. Thing is, travelling back through time can unhinge a guy, even if it is to save the world. We don’t last long in this job – most end their days in the temporal asylums, skipping and skittering through time, hooked to an outboard hippocampus. But while we can export the future to fix the present, we’ll serve Him and You. My experience over the last six months has stretched me to breaking point – temporally, physically and intellectually – but I've been sustained by knowing that the FUTR team is one of the most idealistic, ambitious and fun bunch of people I've had the privilege to work with. I rarely watch much TV, but last Thursday I serendipitously flipped on the chattering cyclops to see a heartwarming episode of BBC's DIY SOS, focussing on the renovation of a young family's home in Haydock. What was striking this family's surrounding community, was not simply the degree to which neighbours, tradesmen and acquaintances freely contributed their time and skills, but more importantly their collective "pay it forward" spirit. This attitude was underlined by a local lottery, administered by residents since 1985, where each resident pays 50p into a weekly fund that supports a community centre for children and the elderly. Half the proceeds are paid out as prize money and the other half pays for running the centre. As presenter Nick Knowles interviewed community members and organisers about the lottery, the warmth with which it was regarded was both palpable and humbling. This is perhaps what David Cameron's Big Society should embody; rather than gimmicky parent-run schools or elected police chiefs, but engendering collective sense of responsibility for each other's wellbeing. I'd like to understand whether the lottery has been a catalyst for deepening and strengthening this community's cohesion or simply been the consequence of an already cohesive neighbourhood. If the lottery has indeed been a catalysing community agent, can local lotteries be transplanted to other communities that have collective goals they're unable to realise? LottoPress: A street-scale "lottery in a box"
The notion of hyperlocal "street-scale" lotteries is intriguing. As it happens, establishing a local lottery is commonplace enough to warrant regulation, so it's not hard to picture a "lottery-in-a-box", consisting of web apps that help establish, administer and operate a lottery. Such tools could drive widespread adoption and help us understand where "social lotteries" could affect change. Modern Britain has recently been characterised by some as a broken society, yet a new generation of "grassroots financial instruments" – like Haydock's lottery, the Brixton Pound, Piedmont's PLENTY and the zero rupee note - illustrate – show that innovating money isn't just about enriching bankers, but also enriching and enabling broader cultures. This week's announcement that OLPC's conceptual XO-3 tablet computer design would launch late this year, brings the OLPC initiative full circle. It's original vision inadvertently ignited the netbook market for lo-fi, connected computers which in turn begat Chrome OS and iPad, culminating in OLPC's closing the loop with its own tablet. Ironically, the original XO-1 was at times more popular amongst geeks than the populations of countries that OLPC sought to assist. What began as an altruistic venture eventually morphed into a hyper-fetished, high-margin Apple product; it's great to see OLPC re-orienting itself in activism once more. The XO-3, based on Marvell technology and a 9" glass display, will purportedly ship before the end of the year, at a cost of $75. It's easy to poke fun at Negroponte's management style, OLPC's layoffs and delays or it's flawed educational model, but perhaps the real legacy of OLPC has been in setting the tone and vision of low-cost portable computing; influencing the likes of Google, Microsoft, Intel and Apple is no mean feat. OLPC's gravitational effect on the industry's giants may sometimes be imperceptible, but it's role as a global advocacy power and concept hothouse has pulled them all towards its vision.